Robert Ludlum's amnesia novel gets the classy espionage treatment in this tense but somewhat lacklustre movie. 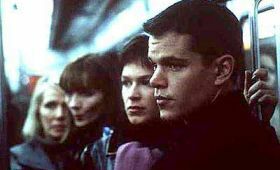 Damon stars as Jason Bourne, an ultra-secret spy who loses his memory after a mission and spends the duration of the film trying to piece together various clues to his identity with the help of a gorgeous stranger (Potente). Meanwhile, his CIA boss (Cooper) is hunting him down with a Paris office worker (Stiles) and a strong, silent assassin (Owen) who's just like the real Bourne. The premise and structure are intriguing, drawing us in from both angles as we see Bourne's inner resources (he seems to have only forgotten his identity, nothing else) pitted against the huge international spy machine. Twists and turns keep the story increasingly complex and gripping, even if director Liman doesn't really pump up the adrenaline. His direction is never more than adequate, although he does manage some decent action sequences and he avoids the self-important rah-rah patriotism that can doom these kinds of films. Damon holds the film's centre securely, keeping us right with him, interested in his quest even though we never doubt that it will all work out for him in the end. And there's fine support around him. Involving and enjoyable, in a slick Hollywood way, it's also a bit slow ... and ultimately rather forgettable.